Also known as a “CAT scan,” CT (Computed Tomography) combines multiple x-ray images to produce a two-dimensional cross-section view of anatomy with as much as 100 times more clarity than conventional x-ray. CT imaging usually takes less than 30 minutes and is used to clearly show soft tissue, like the brain, as well as dense tissue, like bone. The information gathered during a CT scan is processed by a computer and interpreted by a radiologist to diagnose, or rule out, disease. 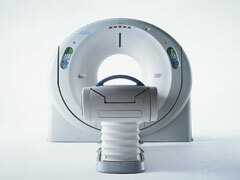 Concord Imaging Center offers one of the most advanced 32-row CT scanners available today. This advanced generation of equipment not only provides exceptional diagnostic accuracy, it also features advanced automatic exposure controls (AEC). Combined with the dose modulation techniques used by our technologists, we are able to effectively reduce radiation exposure to the patient while maintaining precise image quality. The technologist will bring you into the CT scan room where the procedure will be explained to you. The technologist will help you onto the cushioned table. Depending on your study, the technologist or nurse may place an intravenous (IV) line through which an X-ray contrast agent may be given. The technologist will communicate with you during your exam through a microphone. You may be given "breathing" instructions during your exam. As the procedure begins, you will hear a whirring sound as the X-ray tube moves in the machine. The table will move slightly as each picture is taken. To obtain the best possible images, it is important that you lie very still during the exam. Scan times depend on the type of exam and number of body parts imaged, but typically are less than 30 minutes. Preparations vary based on the CT study you are having. Instructions specific to your exam will be provided by your doctor or the scheduling department. You may be asked to not eat or drink anything for several hours before the exam. If you take medications, ask your doctor if you should take them before your CT scan. Any medication should be taken with a small sip of water. If you are having an exam of your abdomen or pelvis, you will be given a flavored drink (“Redi-Cat’) to outline your intestines and stomach. Also inform you physician if you are allergic to any medications, are diabetic, have renal disease or if you think you may be pregnant. If you have a known allergy to IV contrast material, your doctor may prescribe medications to reduce the risk of an allergic reaction. Refrain from solid foods 2 hours prior to the test. You will be instructed to drink one bottle of "Redi-Cat" (barium suspension) 45 minutes prior to the study. Refrain from solid foods 2 hours prior to the test. You will be instructed to drink one bottle of "Redi-Cat" (barium suspension) 2 hours prior to the study and then a second bottle 45 minutes prior to the study. Refrain from solid foods 2 hours prior to the test. You will be instructed to drink two bottle of "Redi-Cat" (barium suspension) 2 hours prior to the study. Refrain from solid foods 2 hours prior to the test.